Filed to: dystopia--now!Filed to: dystopia--now! Is that an especially sickly hue in the smog clouds? A faint smell of ammonia in the air? Maybe this morning feels particularly dystopian because Wisconsin-based Three Square Market plans to become the first US company—and one of the first companies period—to offer microchip implants to its employees. The implants are totally voluntary. As in, the 50+ workers the company “is expecting” to be “chipped” don’t have to do it. No pressure. 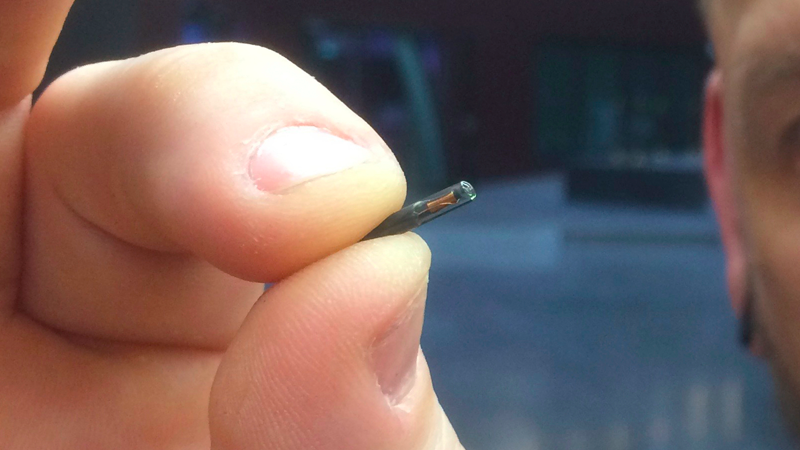 According to Epicenter’s CEO, Patrick Mesterton, the tiny RFID implants are “primarily [used] to open doors (access to building, offices and conference rooms) but have [been] used for vendor machines (smoothie machine) and printers as well.” All told, he estimates about 200 people have been implanted through Epicenter, with any profit going directly to BioHax. Security is a major concern both because it presents new opportunities for hackers to steal data, and for companies to snoop on their employees. “[Data] is stored in the microchip and it communicates with a device (reader, mobile phone etc),” Mesterton told Gizmodo over email, “No data is stored with Epicenter or monitored.” It’s unclear, however, if any data is stored with BioHax, or if those setting could be changed at a company’s request. A start-up coworking space lured by the vague scent of disruptive tech makes a natural pair with RFID implantation. How BioHax came to be involved with 32M, a company that builds software for breakroom “micro markets,” is less clear. What provisions, if any, are in place to remove or disable the chips when someone is fired, quits, or wishes to unenroll? Is no one worried about elective surgeries becoming an abusable form of employer coercion? What meaningful distinction exists between a “micro market” and “a couple of vending machines”? We’ll update if we hear back from 32M. The “chipping party” is scheduled for August 1st, and the slow death of worker privacy rights is slated to follow immediately afterwards.